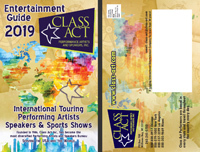 Performers and entertainment including dance, music, jugglers, sports shows, magicians, strolling performers, cabaret acts, mentalist, hypnotists, ventriloquists, comedians and animal acts. Download a PDF of our entire catalog! Call us for custom produced events, name acts and celerity appearances. Please feel free to contact us with any questions that you might have, we're here to assist! If you're interested in receiving copies of our latest catalogs, be sure to fill out our catalog request form - or give us a call at 800-808-0917.